"Our words are stronger than their weapons." Amazon Studios has revealed the first official trailer for the documentary City of Ghosts, the follow-up to Cartel Land made by filmmaker Matthew Heineman. This doc takes a closer look at the Syrian war as told from the inside, following a group of anonymous journalists working to report on what's really happening. Heineman is known for getting incredible footage and diving deep into the subject of his docs, and that's definitely the case here. It's describe as a "powerful cinematic experience that is sure to shake audiences to their core." This premiered at Sundance this year, where I saw it, and it's good but nowhere near as good as Cartel Land. This would also make a good double feature with the doc Last Men in Aleppo, as both films are important looks at the war in Syria. Watch the footage below. Captivating in its immediacy, City of Ghosts follows the journey of "Raqqa is Being Slaughtered Silently" — a handful of anonymous activists who banded together after their homeland was taken over by ISIS in 2014. With astonishing, deeply personal access, this is the story of a brave group of citizen journalists as they face the realities of life undercover, on the run, and in exile, risking their lives to stand up against one of the greatest evils in the world today. 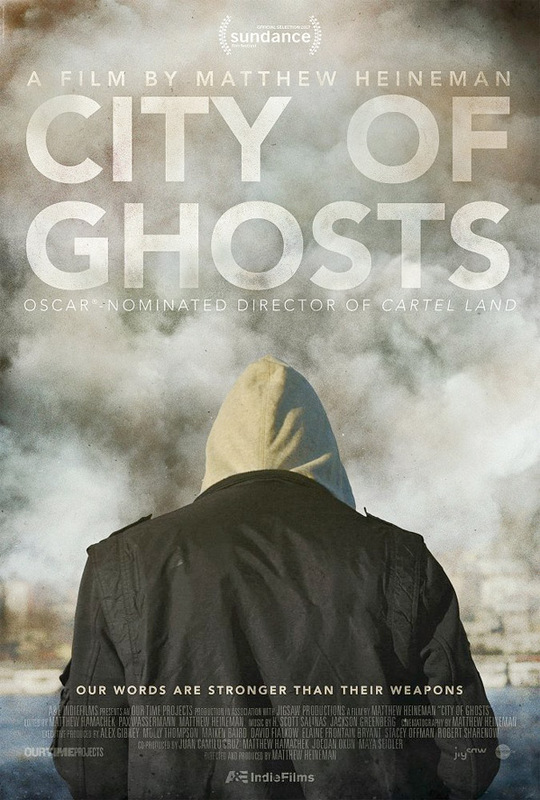 City of Ghosts is directed, produced, and filmed by Academy Award nominated filmmaker Matt Heineman, of the documentary Cartel Land previously. This first premiered at the Sundance Film Festival earlier this year, and also played at the Tribeca Film Festival. Amazon Studios and IFC Films will open City of Ghosts in select theaters starting July 7th this summer. Who's interested?